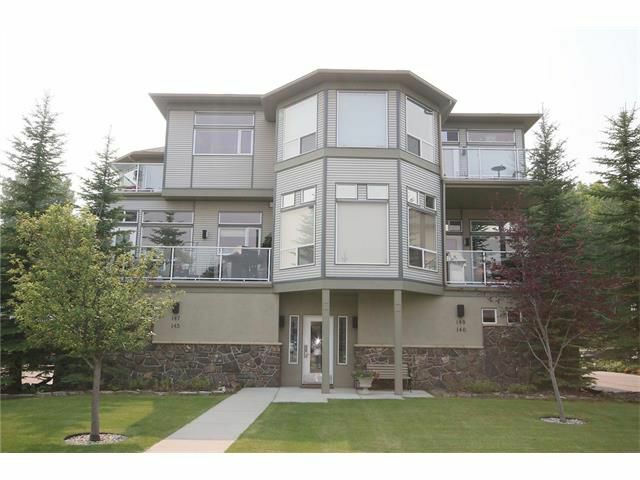 Wonderful LIFESTYLE PROPERTY at 147 Crawford Drive in Cochrane, Alberta. Very unique apartment with secure 'New York' style elevator (right to your door) and a private oversized heated dbl garage. This top floor, 2 bedroom, 2 bath unit boasts a very welcoming floor plan, with 10 foot ceilings, a lovely large living room with a gas fireplace and built-ins, a bright and functional kitchen with lots of cabinets and ample counter space, as well as a separate dining area. There are tons of windows, providing lots of natural light and beautiful views. A large deck provides a great outdoor space, and is accessible right off the kitchen. The master bedroom offers a serene view of the trees & wildlife behind the property. A large ensuite with soaker tub and separate shower rounds out the master suite. There is also a 2nd bedroom and add'l full bath, plus in suite laundry. Just a hop, skip and jump to the river and walking paths, located in a quiet neighbourhood. A must see!